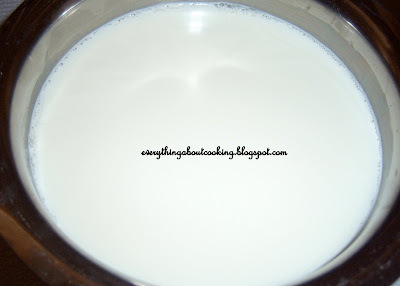 Step 2: Boil milk again and keep it aside till it is lukewarm, pour in a vessel and add 1 tsp of previously made curd or if using store bought yogurt use 2 tsps instead and mix. Step 3: Place covered in the oven or some place warm overnight undisturbed. Step 4: Take out, remove the cover and jsut move the vessel to see if the curd is done if not let it stay for few more hrs(donot disturb it). Serve chilled or at room temp. Enjoy!!! 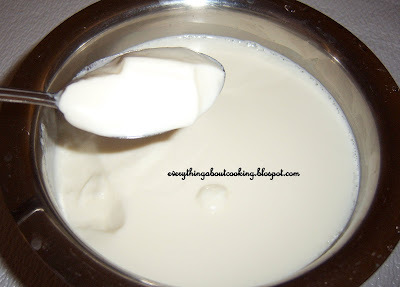 Bhargavi, even I make yogurt at home... :) Maa intlo kuda, homemade yogurt aithey nee tintaaru.... I boil milk in the microwave... that way it is easy and don't have to keep an eye on it, while it is boiling. I agree with u....gud to know u make it at home....nothi'n beats it. Yeah store bought lo aa taste undadu kada....btw I'm too scared to boil milk in the microwave....[:P] ...how many mins do u boil? I make my yoghurt too! This loks creamy and perfect! hey 'm not able to post comments on ur blog ....can u help me with it??? ?